Marine archaeologists have discovered a large iron-hulled steamer near North Carolina’s Oak Island. 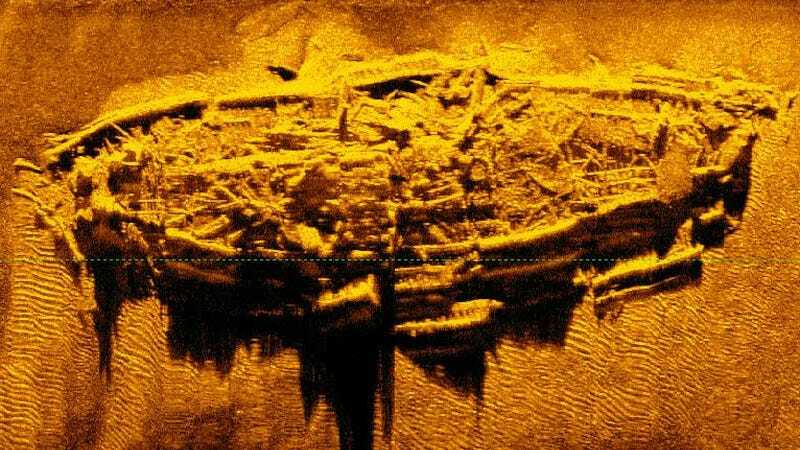 The decaying wreck has yet to be identified, but it’s the first Civil War-era vessel to be discovered in the region in decades. It doesn’t look like much, but this ship has been lying at the bottom of the Atlantic Ocean for the past 150 years. Experts believe the ship was one of three blockade runners used by the South to penetrate the wall of Union naval vessels blocking the port of Wilmington during the war. The researchers are currently trying to identify the vessel; according to historical accounts, three blockade runners were lost in the area, the Agnes E. Fry, Spunkie and Georgianna McCaw. Researchers from the Underwater Archaeology Branch of the North Carolina Office of State Archaeology and the Institute of International Maritime Research made the discovery on February 27 during sonar operations. The wreck is located about 27 miles from Wilmington near Fort Caswell at the Mouth of Cape Fear. As part of its Anaconda Plan, the Union had set up the blockade to prevent supplies from reaching the Confederacy, and to prevent the export of cotton and other marketable items by the Southerners. It was a stranglehold that did much determine the outcome of the American Civil War. During the Civil War, a dozen major ports and about 3,500 miles of the Confederate coastline were patrolled by about 500 ships commissioned by the Union government. Confederate fortifications protected both entrances to the Cape Fear River from the Atlantic, and were critical in maintaining a lifeline until Fort Fisher finally fell in early 1865. As a major investor in the South, Great Britain played an important role in trying to infiltrate the blockade. To protect their interests, British merchants produced steam-powered runners that were longer, narrower, and considerably faster than other ships, enabling them to outmaneuver and outrun Union ships. But by the end of the war, the Union Navy had captured more than 1,100 blockade runners, while either destroying or grounding another 355 ships.